Follow up your morning tour of Windsor Castle with a classic fish-and-chips lunch at a London pub. Make your way to Victoria Coach Station in central London. 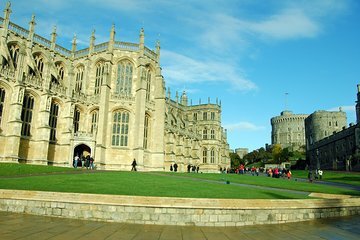 Hop aboard your air-conditioned coach, and make the journey to the lovely town of Windsor, home to magnificent Windsor Castle. As you travel, hear tales of this 1,000-year-old palace-fortress and how it ranks as the world’s oldest occupied castle. Originally built by William the Conqueror in the 11th century, it’s still used by Her Majesty Queen Elizabeth II as a weekend residence and for state ceremonies. On arrival, head inside to explore independently. Stroll around the opulent chambers of the State Apartments, many adorned with paintings by Rembrandt and Canaletto, and learn how they have been home to 39 monarchs. See other highlights and be sure to visit the castle's St George’s Chapel, an echoing Gothic masterpiece that holds the tombs of 10 English monarchs, including the infamous Henry VIII. Afterward, enjoy a little free time to stroll around Windsor town, set on the banks of the Thames River. Perhaps browse for souvenirs in the quaint shops and see the house where William Shakespeare is said to have penned his play The Merry Wives of Windsor. After your visit to Windsor, drive back to London and arrive at the upscale neighborhood of Knightsbridge in the center of the city. Here, head inside the St. George's Tavern in Victoria, and sit down to a traditional, hearty English lunch of fish and chips. Your tour then ends here after your meal. Please note: lunch may be taken at another pub or venue in central London. This was a great tour. Our family thoroughly enjoyed it. The trip was on time and ran as scheduled. There was plenty of time to tour Windsor Castle, and eat and shop in the town of Windsor. The castle was beautiful and worth the visit. The tour was well organized and instructions on where to meet were given and repeated often. The tour guide was excellent. After returning from Windsor Castle, we were dropped off at the restaurant for lunch in London near Victoria Station (you can see Victoria Station from the restaurant). The fish and chips lunch was excellent and a large portion size was given. We recommend this tour if you want extra time to see Windsor Castle. Viator booking made our visit to Windsor Castle with follow up pub lunch very easy, and exactly as described in their online advertising. Customers should be aware that most tours that originate from Victoria Coach Station, London involve considerable chaos with gate announcements and boarding of multiple buses and literally hundreds of tourists- but that is a problem of the terminal, not of Viator. After you are on your coach, the trip went smoothly, and the Viator liaison was very accomodating. We enjoyed ourselves immensely. Windsor Castel - Our guide Dan was very very good. Filled us with interesting facts and stories throughout the drive to Windsor. Took good care of us and got us to where we needed to be. I think more time should have been spent at Windsor, it was a short tour, perhaps another hour would be better. LUNCH - Certainly not worth it. They imply that you will be taken to a fancy place, perhaps to Harrods, but it was just an ordinary pub serving fish and chips. Could have skipped that. Windsor is lovely - premier tours was a disorganized mess. We were dropped at Windsor on time so far so good. We were to be picked up at 1230 by a different coach. After standing at a crowded bus lot for 35 minutes the driver showed up and said 1pm was the correct pick up time. We waited 35 minutes in a lot when we could have been enjoying Windsor! While traveling back to London our driver pulled over and said he had driven 4 hours which was the limit and we needed to wait for a replacement driver. Why premier sent a driver who couldn’t get us back to London is beyond me. The first driver said it would be about an hour before we got back (wait time for the replacement driver plus traffic). We bought a morning tour with a pub lunch but nearly everyone decided to leave the bus and take the tube or taxi onto another destination rather than wait around. I would recommend seeing Windsor but use a different tour company! This was one of the best trips we took. There was another trip going on to other locations, but we chose this option which gave us enough time to enjoy the tour without rushing. There were no photographs allowed inside the buildings, which was strictly enforced by the staff. The gift shop, however, had a tourist booklet for 5p that was affordable and captured the best of the interior. We saw the changing of the guard here too, which was interesting to watch. The coach picked us up and returned us to London for lunch. The fish and chip meal was excellent as well as the service. This was a great way to see Windsor Castle. The guide gave us a history lesson on the one hour ride to Windsor. 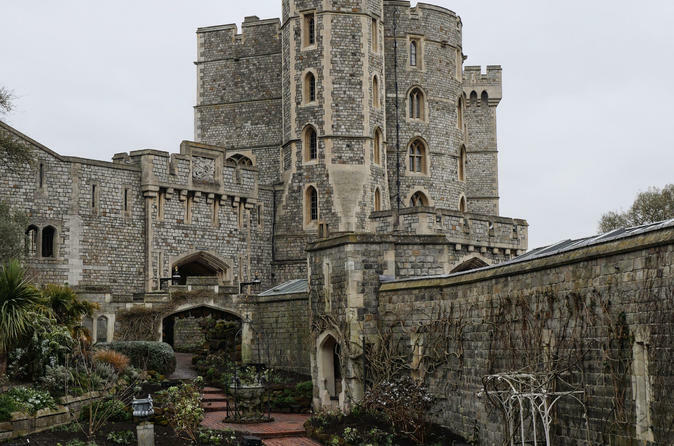 Our group consisted of two tour groups: a half day trip to Windsor with a pub lunch and a full day trip that left Windsor for Bath and elsewhere. We were with the half day tour and were told to meet our new bus a specific time. Felt a bit like we were left on our own and the new bus was 45 minutes late due to traffic. It was a bit of an abandoned feeling. Windsor Castle was amazing and full of history. The time allotted was plenty to of time to see the castle, the chapel, and the grounds, but not enough time if you wish to explore the quaint little town and the shopping available in the town. But if your interest is solely in the castle, you will have plenty of time. Lunch at the pub was fish and chips and very enjoyable. Great Tour! Windsor was a wonderful town, we had tea but could have stayed there for lunch. The guide from London was excellent! Fun, knowledgeable and completely professional. We did the half day tour and the driver who took us back from London was personable and very accommodating - dropped us off at the pub for lunch. Lunch was delightful. It was a great family outing - and the pace gave everyone time to see what they wanted. Thank you!! Good tour...........lots of history..........did not go to the place for lunch that was told. You could only have fish and chips and that's what we had the day before.